Oktoberfest : While beer is the highlight during the 16 days festival, if you leave without sampling the food – you have done it all wrong. Oktoberfest is the biggest beer festival in the world, hosted in the beer capital of the world – Munich. Every year more than 7 million litres of beer are consumed within16 days at the grounds of the Oktoberfest (Theresienwise). But it is not all about the beer at the end of the day. Let’s have a look at the food statistics : 549,899 chicken units; 140,225 pairs of pork sausages; 44,320kg of fish; 75,456 units of pork shanks (Haxen). And these numbers exclude the food that has been served at the stands outside of the tents. 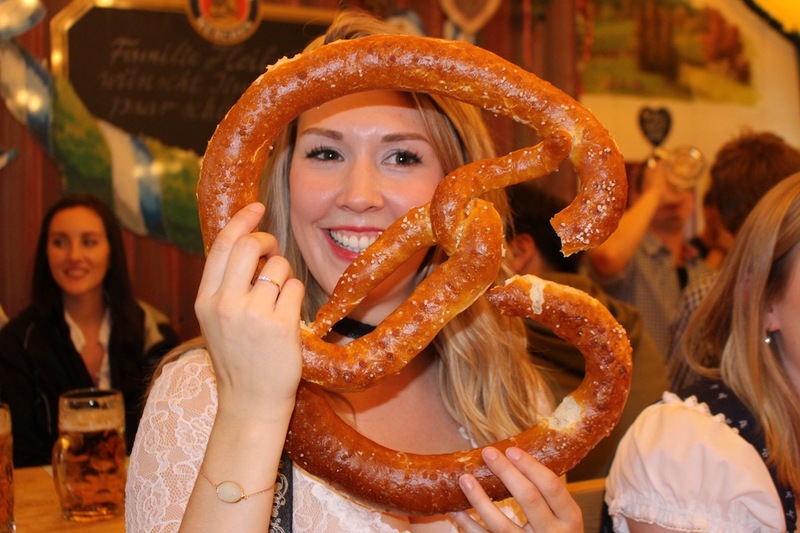 So now lets have a look at all the must try foods when you visit Oktoberfest. 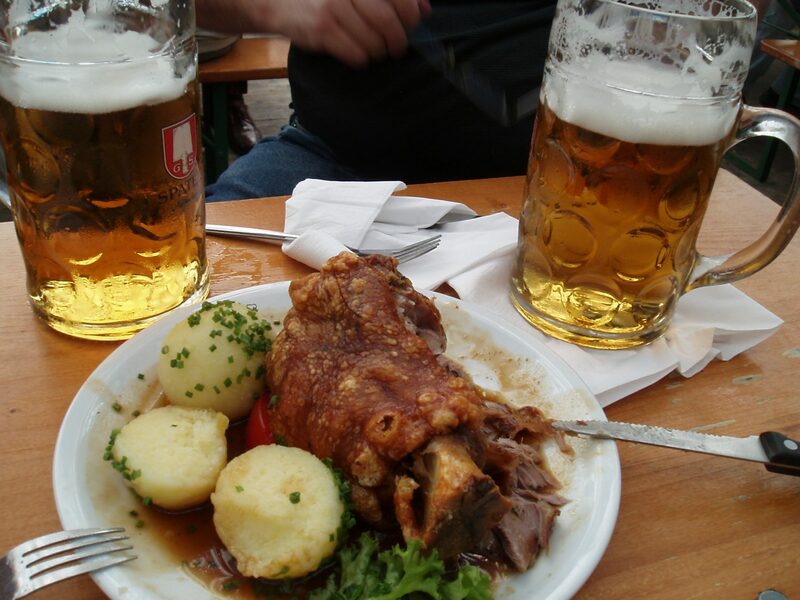 It is one of the most popular meals at the Oktoberfest. The first original grilled chicken stall dates from the 1881. 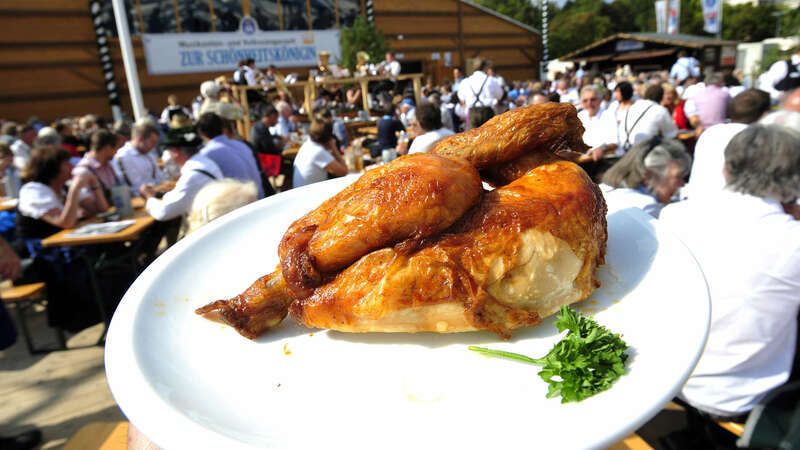 The chicken can be seen as the first animal that has been sacrificed at the altar of the Oktoberfest. And lets be honest, nothing beats ripping at a roast chicken with your fingers, after enjoying a few litres of beer. They are always freshly grilled at the Oktoberfest and seasoned with different spices. Tender meat and crispy skin. They can be complimented with a potato salad. This Bavarian classic is probably one of the most beautiful meals on Earth. Served in a pool of gravy with Knödel (famous Bavarian boiled dumpling with strange, yet addictive chewy texture). Schweinhaxen is usually marinated and roasted. It is a great starting point for every Oktoberfest night. It may not be for everyone, but if you are willing to try something new, strongly recommending to just go for it! The good aspect of the meal, is that it is good both hot and cold. You should not worry if you cannot finish it in one go (as it will probably be the size of you head), it can always compliment your beverage later in the night. So grab your knife to cut to the bone, and enjoy this giant deliciousness with a litre of beer. You are in Germany – sausages here are important. You cannot visit Bavaria and not experience one of the many varieties that they offer both inside and outside the tents. The famous Bratwurst can be seen as a cultural heritage in Germany. Documentations report that it was invented nearly 2 centuries before Columbus discovered Americas in 1492. There are over 42 varieties of wursts in Germany. They differ in size, type of meat used, cooking method, texture and seasoning. One of the most popular orders at the Oktoberfest comes in 2 pairs of pork/veal sausages + sauerkraut + mustard + bread. A great way to enjoy it, is to spread the mustard on the bread, add the sausages and the sauerkraut on top and enjoy a delicious sandwich! This meal is served in all Oktoberfest tents. Another specialty is the famous Weißwürste (white sausage). It is made of veal/pork ,seasoned with lemon, mace, onions, ginger, parsley and cardamon. It is usually served in a pot with hot water (yes, it is a boiled sausage) , pretzel and mustard. It goes best with the famous Wheat beer (Weizen, and no, they don’t serve it with lemon or orange). Its a ritual when it comes to eating Weißwürste. You have to place the sausage on a plate, cut diagonally with the knife, as you have to peal the skin off (Do not start cutting while the skin is on, Bavarians around you will giggle at you, yet explain the right way to do it). When you remove the skin, cut a piece, dip it into the mustard and enjoy with beer. It is seen as a great starter. Such a meal is also know as a Bavarian breakfast. Breakfast hours at restaurants are between 7am and 11am. A lot of hotels also serve it during breakfast. So if you are ready to go real Bavarian style, that’s the right way to do it! Leberkäse (literally translates to “liver cheese”). However the sausage does not contain neither liver or cheese. It is made of minced pork, corned beef and onions. Similar to a pink meatloaf. You will not find it served inside the tents. It is more of a snack. Almost every supermarket offers leberkäse slice in a bread roll, complimented with mustard or ketchup. The best place to find it at the Oktoberfest is at the food stalls outside the tents. It is great snack to grab on the way home, after leaving the tents. It is a grilled sausage, cut and served with curry-flavoured ketchup. The sausage is made of pork or veal. It is considered to be number one street food in Germany. Also knows at the Berliner currywurst. Tents do not serve them, however you can find them at one of the food stands outside. Usually served with french fries on the side. You can enjoy it best with Helles (lager beer). As the name suggest it is a meter bratwurst (40 inches)! This sausage dates from the early 1953, invented by Lawrence Stark (if you follow Game of Thrones, you might think he was also related to Rob Stark, but I will not spoil, as the next season doesn’t air until the early 2019). Back to the sausage history – While Stark was working at a restaurant, one of the guest in the room shouted “I can Wurschat The meter setting ess” , meaning that he could eat a whole meter sausage in one sitting. Lawrence took the challenge and invented his first meter sausage. The new sausage concept not only attracted more people, but also lead to annual competitions. The current record holder is Andreas Schäfer (19 years old at that time), who consumed 5.60 meters (220,47 inches) plus side dishes in 1999. So if you are feeling competitive, you can try to beat his record this year! You can find the famous Meterbratwurst at the food stands at the grounds of the Oktoberfest. Nowadays, they serve them either 1 meter (40 inches) or half a meter (20 inches), between a bun roll. A tent that specialises in sausages is “Zur Bratwurst”. It is probably the most unusual tent you can find at the grounds of Oktoberfest. It is more of a two storied timbered house. One of the small tents, it can accommodate approximately 170 guests. The most popular order is “Rostbratwürstl” – fried sausages, which have been grilled over. Another specialty of course is the famous bratwurst – made of veal or the roast pork. Salt-studded pretzels are the ultimate Oktoberfest classic of all times! Beer and a pretzel is an absolute stereotype, but there is a reason why. Always freshly baked, with a crispy and salty top, they make a great snack while you down your beer. They do come in small and big sizes, but you want to opt for the big ones. Inside the tents, you will see the waitress walking around with massive baskets full of pretzels. Always grab a few to share on the table. By the time everyone tries “just a little piece”, they will disappear before you know it (If you were wondering why some people have trust issues). Pretzels are a great snack for any type of beer. You can also compliment them with the famous Bavarian dip – Obatzda. A cheese spread – mix of camembert, cream cheese, soft butter, seasoning – including beer. Pretzel, obatzda and a beer are also very popular combination, when enjoying a day in a beer garden. The best option for vegetarians, and not only! A lot of people compare the famous Bavarian Käsespätzle with American Mac and Cheese – wrong. It is not orange … Bavaria is famous for dairy production, so if you take a day trip in the country side, you will see a lot of happy cows enjoying the sun up and down the hills. The reason why you get good cheese – the real deal. Käsespätzle is doughy dumplings (made of flour and water) , mixed with a few different types of cheese. All that goodness is baked and topped up with fried onion…delicious. This gut-bomb is a great hangover cure as well. It pairs perfectly with both wheat and lager beer. Knödels (dumplings in English) are the absolute solution for soaking up a boozy belly and keep the hunger away for hours. 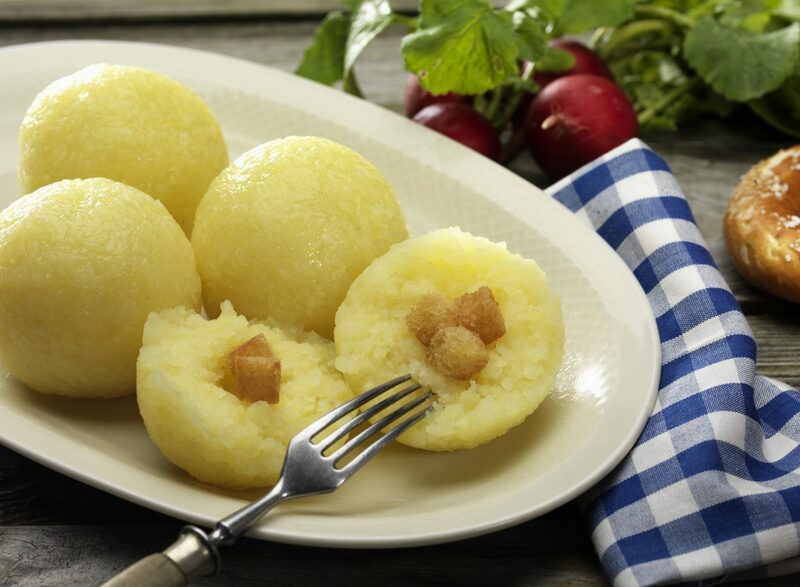 Also known as the icon of the Bavarian cuisine, they are made of potatoes or stale bread. It may not sound or look particularly appetising, but as we all know – don’t judge just by the looks. Same as the sausage you can find several varieties of dumplings : spinach dumplings, apricot or pumpkin, bread dumplings, potato dumplings, cheese and even banana dumplings. The traditional recipe and what you will find mostly in restaurants and beer tents are the bread dumplings. They are usually served as a complimentary dish along with pork slabs (Schweinsbraten) for example, with savoury gravy. The Knödels are honoured at the Oktoberfest with a tent that spreads the dumpling culture – Münchener Knödelei. If you would like to experience some Bavarian dishes with a twist, this is the place to visit. Best to enjoy with wheat beer. Talking about satisfying all tastebuds, Kaiderschmarrn is a must try dessert! It is basically a fluffy shredded pancake (not your regular pancake). Usually dusted off with powdered sugar, complimented with some apple sauce or ice-cream (or why not both?). As it is a very generously sized dish, it can also replace a meal. You can find it in most tents at the Oktoberfest, but there is a tent for sweet goodies that is recommended if you would like to satisfy your sweet tooth – Café Kaiserschmarrn. It looks like the house from Henzel and Gretel – gingerbread castle looks. You can find many more sweet delights there as well. We all know Germans are famous for their baking skills. The tradition of baking strudels goes back to the early 1500s. 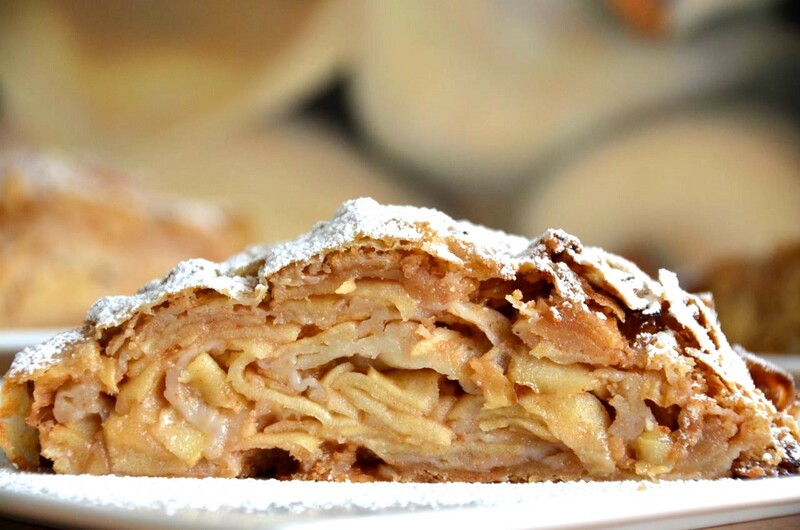 The famous apple strudel is an apple-filled pastry. Can be both dessert or a snack, served warm or cold. It is usually complimented with ice-cream or vanilla sauce. Most of the tents would serve it as a dessert at the Oktoberfest. By far, the best apfestrudel you can find in Munich is at the Augustiner beer garden. While walking through the grounds of the Oktoberfest, you can not avoid the smell of freshly roasted almonds covered with sugar, caramel or different types of chocolate. Be warned that they are ridiculously delicious and addictive. But definitely a must-try. Grab a bag or two, and enjoy a nice walk through the rest of the different stalls you can find at the Oktoberfest grounds. Or why not trying some of the fruits that they have covered in chocolate as well? You will not miss these areas, as you will be able to catch the smell from at least a mile away. Such treats are also very common during the Christmas markets in Germany. They do look delicious, and technically you could eat them, however it is a mistake to do so.They are mainly seen as a decoration and a nice souvenir you can take home. You can find them in different sizes and colours. What makes them a great souvenir is that you can customise them and write whatever blows your mind on it. 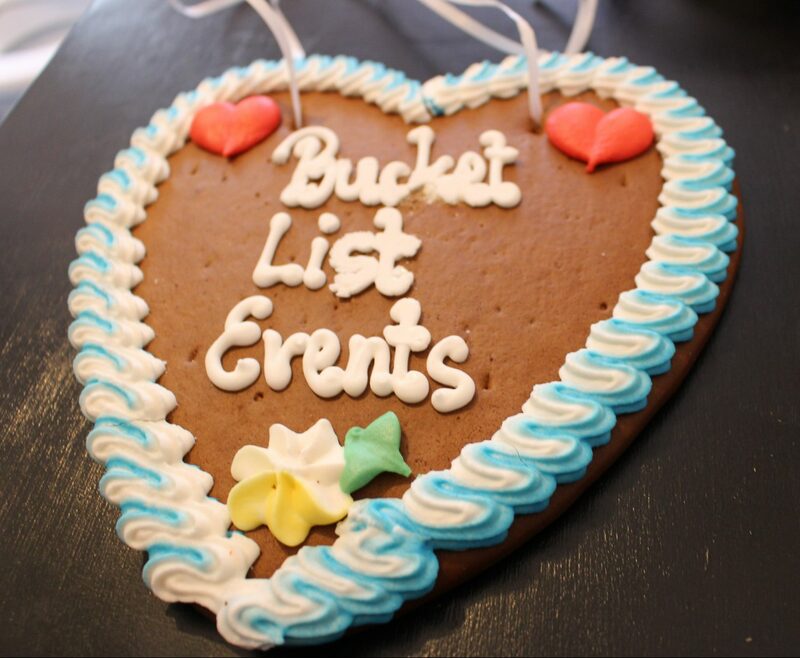 People would usually write wishes, names or dates to memorise a special occasion. Usually hanging in most restaurants, houses, cafes. These dried oversized cookies will definitely survive the journey back home in your suitcase, so you should not worry about breaking them.